The XIIIth International and the VIIth European Congress of Clinical Chemistry took place at the Netherlands Congress Centre in The Hague, from June 28th to July 3rd 1987. The Organizing Committee and the Scientific Committee for these combined congresses aimed to present the state-of-the-science as well as the state-of-the-art for those fields of clinical chemistry which show a strong progress and which will most probably inflict a great part of all clinical chemists. 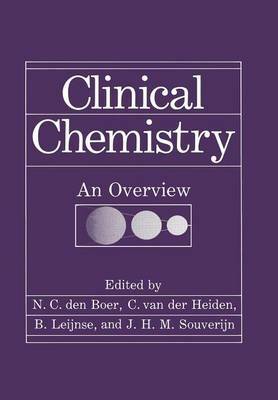 "Clinical Chemistry, an Overview" comprises almost all papers which were presented during the congress in 5 plenary lectures and 97 lectures during 24* symposia. The invited speakers, being experts in their fields of clinical chemistry, succeeded very well in presenting an overview over the newest developments in connection to the knowledge already known, thereby demonstrating the progress made in clinical chemistry during the last years. The Editors take great pleasure in thanking once more the members of the Scientific Committee and of the International Scientific Advisory Board in creating an excellent scientific programme for this congress. The Editors also take great pleasure in thanking all those whose afforts have made possible the publication of this book. We are most grateful to all speakers who also prepared a manuscript for publication. The Editors also appreciate the most helpful and encouraging attitude of Plenum Press Publishers Corporation.